Harper-appointed senator, Bob Runciman got all pen-to-paper-like today and went into a Duffy-style rant over political message carriers walking into the anointed one's private hob-knob session in Vancouver. Former Ontario solicitor general Bob Runciman is questioning why two activists who got to within an arm's-length of the prime minister this week were allowed to "walk away scot-free and smiling" — and he says he'll use his Senate seat to bring in new laws to deter similar future protests. He then blathers on to say he's going to do something about it and intends to abuse his cushy position by introducing legislation just like, you know, an elected representative to Parliament. He also elevates the position of Prime Minister to something it is not, in a constitutional sort of way. 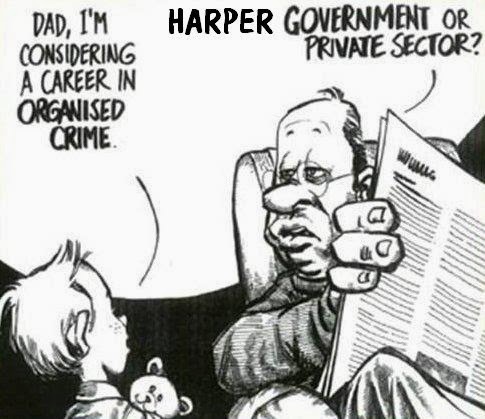 That's OK. Harper appointed senators don't hold much stock in this neck of the woods. (I'm trying to think of what I would say to this gas-bag if I had the opportunity to meet him face-to-face. It has something to do with "the troops" but it escapes me now). Loud mouthed, Conservative, Harper-appointed, public teat-suckers should really be careful what they wish for. poor senator bobbie. he must have forgotten stevie is an elected official. people have the right to protest, ask him questions, walk up to him, ect. No one has to agree with stevie. if senator bobbie wants to try to implementing leg. this ought to be good. does that mean all those annointed highly paid senators might show up for work. you gotta love these idiots. at least lets send the boy back to school and have them explain this is Canada, not the U.S.A.
As MoS so ably points out over at Disaffected Lib, it's going to be quite the job keeping criminals away from Stevie boy--he keeps appointing them to positions at his side. Although admittedly he's normally pretty effective at preventing them from exercising free speech rights. I'd be surprised if they didn't use this to in some way criminalise the act of being within X number of metres of the PM. It would give them the protest-dampening power reporters, opposition MPs, anyone really. Indeed, that could be the intent of this all along, if, say, it wasn't an oversight to let them through.